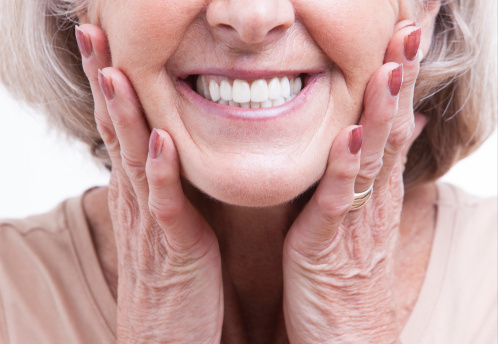 Dentures have been a reliable tooth replacement option for many, many years. Everyone has heard the story about George Washington’s wooden teeth. Well, thankfully, dentures today have come a long way. Whether you are missing all of your teeth or only a few, you may be a perfect candidate for dentures. Dr. Joe Isaacson and his team of dental hygienists and dental assistants in Oklahoma City, OK, are skilled at providing patients with dentures that look and feel natural. Regardless of why you’ve lost teeth, Dr. Isaacson and his team will work with you to restore your complete smile with dentures. Essentially, dentures are false teeth that are mounted on a gum-colored base. But that is only the beginning. Dentures can be the perfect solution for a variety of situations, and they come in a variety of configurations to meet patient needs. A Partial denture can be either fixed or removable. Designed for partially edentulous people—people who have lost some of their teeth—partial dentures work in and among your existing teeth. Depending on how many teeth are being replaced, a partial may be held in place by metal clips that fit around adjacent teeth. Dr. Isaacson prefers that patients not sleep with their partial dentures. In addition, partials need to be cleaned and disinfected daily, so overnight is the perfect opportunity to do this. Full dentures are for people who have lost all of their teeth. Dr. Isaacson designs dentures that not only fit your mouth, but complement your facial features, too. As such, your dentures will feel and look more natural. Of course, wearing dentures does take some getting used to. But rest assured Dr. Isaacson and his team are always available to adjust your dentures, so you are completely comfortable. Perhaps the best option for dentures are implant retained dentures. As the name suggests, implant supported dentures are dentures—sometimes the ones you already have if they fit well—that are anchored into place by dental implants. In this case, your dentures will be held in place securely with dental implants that are strategically positioned and surgically implanted into your jawbone. If you’ve been contending with the difficulties of having one or more missing teeth, then call the office of Dr. Isaacson to schedule an appointment and learn more about the dentures of today. We proudly serve all patients in and around the Oklahoma City, OK area including Bethany, Forest Park, Edmond, Piedmont, Arcadia and beyond.